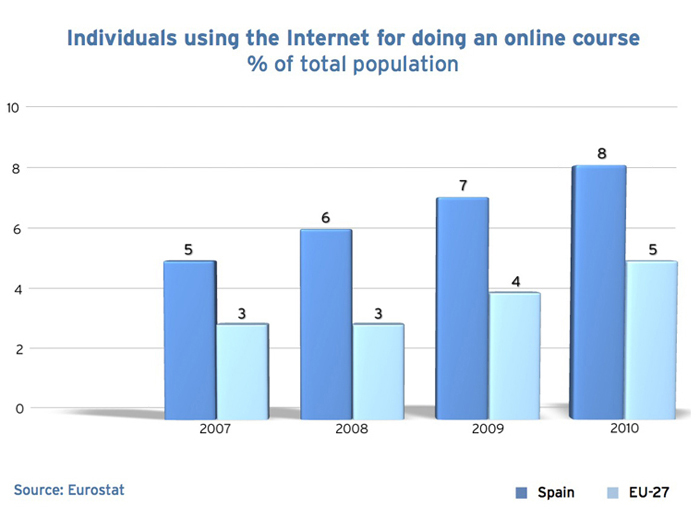 In the EU-27, the number of individuals using the Internet for doing an online course has increased by 1 percentage point in the last year, from 4% in 2009 to 5% in 2010. Particularly, Slovakia experienced sharp growth, from 1% in 2009 to 32% in 2010. Spain records a value of 8%, above the EU-27 average, similarly to countries like Lithuania, Sweden and the United Kingdom. Number of individuals, expressed as a percentage of the total population, who have used the Internet for doing an online course in the last three months.